Larger than many countries, Vancouver Island, stretches 450 km (280 miles) from Victoria to Cape Scott and anywhere from 80km (50 miles) to 100km (62miles) in width. The west coast of Vancouver Island is rugged, with its deep fjords, long inlets and grand mountains that overlook the island and ocean. The west coast area is populated with small fishing and logging communities. The east coast's rich fishing streams, farmlands, timber, tranquil sandy beaches, quaint villages, bustling towns and cities make it an explorer's paradise. 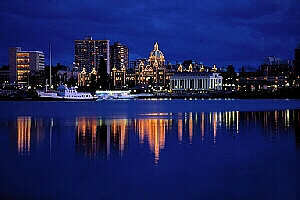 Also along the east coast is the province's capital city, Victoria, a beautiful and historic spot. The Island abounds with great fishing from the ocean, lakes and rivers. Hundreds of hiking trails for the novice hiker to the experienced backwoods mountaineer can be found around the entire island. Other activities include whale watching, canoeing, kayoing, swimming or visiting the many historic and heritage sites on the Island. Access to Vancouver Island is via the BC Ferries Service. This vehicle and passenger fleet of over 40 vessels serves Vancouver Island and the BC coast. From the lower mainland, ships depart from Tsawwassen to Schwartz Bay (located near Victoria on the island), a stunning journey of 32 km (20 miles) and to Departure Bay (Nanaimo). A second terminal is located in Horseshoe Bay in West Vancouver. Other Gulf Islands serviced by BC Ferries include Salt Spring, the Penders, Galiano, Mayne and Saturna.